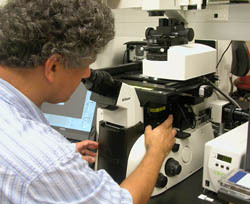 The Microscopy and Imaging Core Facility was established in 2002 as a cornerstone of the Center for Plant Cell Biology (CEPCEB) and is now part of the Institute for Integrative Genome Biology (IIGB). The facility houses state of the art and legacy equipment including five confocal microscopes, 3D Palm super-resolution, an SEM, a complete set of tissue sectioning instruments, a laser capture system, a gene gun, a fluidics robot, fluorescence microscopes, a luminescence dark box, a macro imager and 2D and 3D image analysis software. The core is managed by Dr. David Carter who has more than two decades of experience in academia and industry; designing, using, and optimizing confocal systems; writing training literature; and supporting hundreds of users from all disciplines across Campus. All training is free of charge. All resources can be booked online by the hour, with expert assistance available at no extra charge during business hours.